Recycling, it’s quite the catch-phrase these days and of course it’s an important way to help protect the environment. But what about PREcycling? Precycling can be defined as making purchasing decisions that will delay or reduce the need to recycle or dispose of waste. Repurposing items to another use is a good example of precycling. I’ve been able to reduce all kinds of landfill-bound trash by repurposing items. I’ve eliminated spray bottles previously filled with cleaners going to the landfill by refilling those spray bottles with my own cleaners. These cleaners are typically made from a mix of either soap/water or vinegar/water. And reducing your use of disposables is another example of precycling. For instance I no longer use disposable plastic razors. Now RancherMan & I opt instead for a steel safety razor and real honest-to-goodness double-edged blades. Initially I was afraid to make the switch. My thinking was that I’d need those 4-5 blades with the strip of protective aloe to be able to shave smoothly without cutting myself. But my hate for plastic trumped my fear. So I gave it a try and was pleasantly surprised. (kinda makes me want to kick myself for not doing it years ago.) Not only is is substantially less expensive but an environmentally friendly choice as well. So several years ago I purchased an inexpensive small glass bake-ware pan with a snap-on lid. I even made a Cute Dish Carrier with repurposed denim. It was made to look purse-like so I wouldn’t feel awkward just carrying in a glass dish. 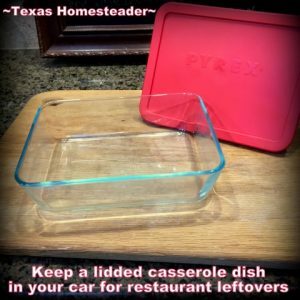 When the dish is empty again I just wash it and allow it to thoroughly dry, then snap 3 of the 4 corners of the lid onto the dish so it stays clean and I store it in my car. Since it’s always in the car I have it with me even if we stop for an unscheduled restaurant meal. I just grab this small dish & carry it in with me. If I end up with leftovers they are transferred to my container. I then bring them home & place it compactly into the fridge. That way I can enjoy restaurant leftovers for lunch the next day. And since this glass dish is microwave safe I can heat & eat in the same dish. No extra dirty dishes, no extra trash! Win/win! Another way I’ve been able to reduce landfill trash is that I make my own laundry detergent so those bulky containers are eliminated. 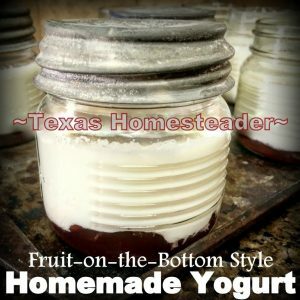 I also make my own yogurt so those containers are eliminated as well. But even if you don’t have the time or inclination to make this stuff yourself (but trust me, it’s EASY!) you can still make a big impact by being mindful of the things you DON’T buy. Look at the packaging of things you purchase. Shun those that are over-packaged whether or not the packaging can be recycled. Those beautiful bell peppers are on sale, but they’re sitting on a styrofoam tray and entombed in multiple layers of plastic wrap. PASS. I’ve passed up over-packaged produce, items for our home and even toys for my grandbabies in favor of less-packaged options. And I often buy used so there’s NO packaging involved. SCORE! Another huge improvement in reducing our landfill waste stream is using our composter. I purchased this *compost tumbler a few years ago and so much goes into this composter instead of the trash can. Those veggie peels and apple cores are now turned into black gold for my veggie garden. And the landfill-bound load is further reduced. What about junk mail? 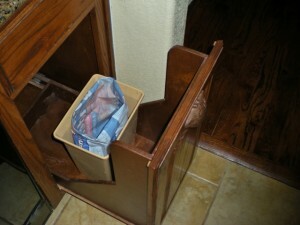 We’re pretty adamant about removing unwanted junk mail from clogging our mailbox. The law requires that if you OPT OUT of a company’s promotional offers that company must discontinue sending junk mail to you. Oftentimes I’ll send them an OPT OUT email and bcc myself so I have record of having sent it. When I receive a second mailing from them I’ll “reply-all” to that email and in bold print write SECOND REQUEST – PLEASE RESPOND. They’re able to see that I’m tracking my opt-out requests and in almost 100% of the cases this puts an end to it. You can also opt out of almost all marketing by visiting the website www.dmachoice.org. They place your information on a file made available to all direct marketers. It costs $1 but it was one of the best dollars I ever spent since it was a one-stop shop. And it brought the junkmail volume down immediately. I tackled the remaining trickle myself. Now a piece of junk mail in our mailbox is rare. When it does happen I simply make email contact with that company and request to be removed from any future marketing mailings. By using these tactics and by recycling those things that we can we’ve reduced what is sent to the landfill from our home enough that we use only a bathroom-sized waste basket as our main household trashcan. And we don’t buy trash bags. The can is lined with whatever appropriate-sized plastic bags work themselves into our home. Whether it’s the bag from a large family-sized container of cereal or the occasional plastic shopping bag that someone brought something to us in. (we don’t accept plastic shopping bags when we shop). This small trashcan only needs to be emptied about once every couple of weeks. I feel pretty good about that! Want To Read More About Our Zero-Waste Journey? Using A Non-Disposable Safety Razor Is EASY! 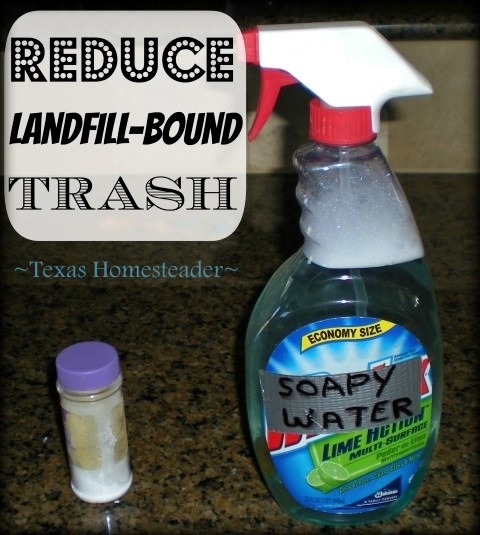 This entry was posted in Blog Posts and tagged Environment, Frugality, Gardening, Make-It-Yourself on April 20, 2014 by Texas Homesteader. Love these tips. I’ve been purposefully working on reducing our impact on the landfill for years. Thanks for sharing at the #ThisIsHowWeRoll Link Party. We sometimes go a couple of months before needing to have the garbage truck pick up our trash – it’s amazing how easy it is to reduce landfill-bound junk if you compost and try to think about what you’re buying! These are some great tips! I’d be careful about reusing a plastic spray bottle that previously had chemicals in it just because they can leach into the plastic and then back into your homemade solution. But how do you like your composter? 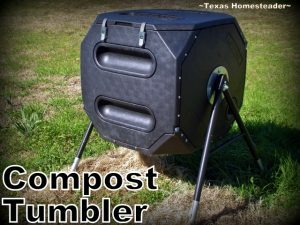 I’m looking around for one to buy to start composting! Excellent suggestions all, and I’m thrilled to find another grandmother passing these solutions along to her grandkids. One of the most difficult plastic-wrapped items for me to give up so far is frozen vegetables and fruit. We used to use several bags a week (we don’t have access to a garden or freezer large enough to put up our own). We’re down to a few a month now, since we now rely on mostly fresh fruits and vegetables year round. But I still put five or six a month into my trash can. The other biggie is cheese wrappers. We buy less cheese now too, but we still go through a couple of 8-ounce packages a week. I tried buying from a store that cuts and wraps; turns out their paper is plastic lined, and they have very few organic, local, grass-fed options. The good news is, we’re reducing our one-use, overly wrapped items. After tracking our kitchen trash for four years, we’ve leveled out the last two at about two pounds every two months, most of it plastic wrappers. The bathroom trash is something else though. That’s going to take some heavy work to fix. while I do make my own cleaners due to allergies – I always thought of the health angle of using them – the fact that my dogs are not allergic to them, and that I eliminate the toxins out of our home, so my kids are safer. I never thought about trash reduction. Not like I needed to be convinced even more, but it makes a great selling point, when I am talking to family members who think I have lost my mind. Great post! Do you add to your compost box daily and how long does it take to become compost with a tumbler like you have? What a great post! Thanks for sharing it with the Say G’day party! Pinned all and hope to see you on Saturday! Great tips! I do recycle everything that I can, we have curb side pickup and I take my plastic bags to the store. I do make some of my own cleaning products and gardening concoctions so I save containers for those. I did have a compost on a stand but the thing kept popping out of position so I couldn’t spin it )-; finally got fed up and sold it and just made me one on the ground, more work because I have to manually turn the leaves, etc myself unlike the simple give it a spin composter. Maybe one day I’ll get me another one. Yours looks like a better heavier duty one then I had. Thanks for sharing! I’m always happy to see people who try their best to not create more trash. Kudos to you! I’m really excited to be living in western Washington now, as we have curbside recycling for just about everything except glass. It’s also common to have a compost pile, so we have a good sized one going in the back yard now. I make my own laundry detergent too, and am going to make my own dishwasher detergent now that our new one is installed. I even refill sample-sized bottles to keep out on my bathroom counter because they take up less room, and I hate to throw them out. Wow that’s amazing that you have so little trash. We’ve been trying to reduce our footprint and are slowly making progress. You’re such an inspiration. Thanks for sharing this on Merry Monday. I really like these ideas! I will definitely be implementing these at our house. Thanks for sharing! Pinning this to our Mostly Homemade Mondays board! Thanks for linking up this week. These are such great tips! I like that you emphasize ways to reuse things to keep them out of the landfill and not just throw them in the recycle bin! Recycling takes tons of energy and resources too. Yes! I wholeheartedly agree. And once you make that mindset shift, reducing waste is actually not inconvenient like people might think. It just takes changing our habits. Great ideas. I want to get a compost, I am working on making my own cleaning products and we do recycle but I know we could do better thanks for the tips they will help. Where did you get the razor you mentioned? I use the ones with the disposable heads so at least I am not throwing the handle away, but would love an even better alternative. I love the junk mail reduction idea. You’ve used the service you mention for a while now and it’s totally legit? (Just asking because I’m always nervous about filling out forms like that.) About the compost tumbler, we bought one last year and I love it too, but I do have a sneaking suspicion it might not benefit the environment all that much on balance. I got to thinking: yes, I put a half-gallon or so of stuff in there daily that would otherwise go in the trash (including non-recyclable paper like used kleenex and toilet paper rolls), but on the other hand, how many loads of compost would I have to make to counterbalance the environmental cost of manufacturing the tumbler itself? Likely many decades, I suspect. . . I wonder if anybody out there has done the calculation? You know, with DIY cleaning products, you never really think about the amount of trash that’s being reduced. I always think about a safer, cheaper alternative for the home, but it’s a good reminder that it reduces trash, too. Thanks! I love the ideas, but why can you not use a disposal for food waste with a septic system? We do, and have for nearly 20 years. We have recently set up a compost pile, but that’s only been in use for a couple of years.